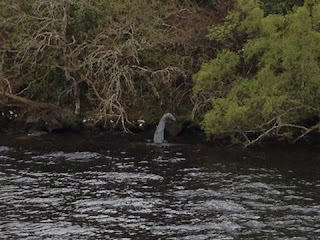 Thanks to Gary Campbell of the Official Loch Ness Monster Sightings Register, I have more information on the event, so we can proceed a bit further. 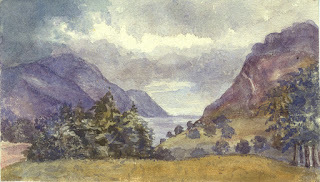 The witness, Hayley Johnson, was at the part of the bay near where the rivers Enrick and Coiltie empty into the loch at Urquhart Bay. The date was yesterday (1st May) and the time was about 8:30pm. The viewing conditions were good under a cloudless sky (see accompanying photograph). The length of the sighting was about 30 seconds before the object disappeared and it was about half a mile away as the Sun recounts. The camera was an iPhone 6 and she was the only person present. Hayley emphasised to Gary that the object was not there this morning when she went back to check. But what was it? A log or a bird or something else? My inclination is not to accept a log purely down to the shape of the object. As I pointed out in a short article last month on deceiving logs, these things tend to grow in straight lines and not undertake curves as this object appears to do. I sketch a general outline below, but if it is a log, it will still be around, so let's see if anyone produces a picture. In that light, I will let this lie for a week to see what happens on that score. This was another picture Hayley took at the time. note the log on the beach showing a rather more straight configuration. POSTSCRIPT: Apparently this was photographed in the vicinity on the 7th May (six days later). It has a very papier-mache look to it and one wonders if an Adrian Shine type experiment is going on? 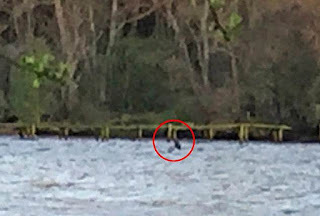 A tourist has captured an image she believes could be the famous Loch Ness Monster - the first reported sighting of the creature in eight months. Hayley Johnson, from Manchester, noticed a strange and dark shape at dusk in Urquhart Bay, near Inverness, Scotland. 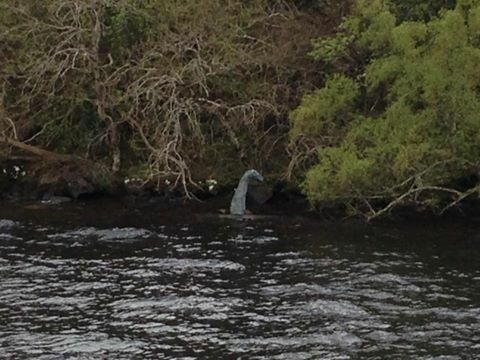 Nessie's official recorder, Gary Campbell, had became 'worried' that there had been no sightings of her for almost a year. Fans from Adelaide, Australia, and Moscow, Russia, called Mr Campbell - who records every reported sighting - to voice their concerns. The Home Office recently rejected a cheeky bid by a group of artists from Glasgow to grant the Loch Ness Monster permanent UK residency after Brexit. But Mr Campbell, keeper of the Official Loch Ness Monster Sightings Register, had said it had appeared Nessie had left the country already. However today he was relieved after Ms Johnson's sighting on May Day. 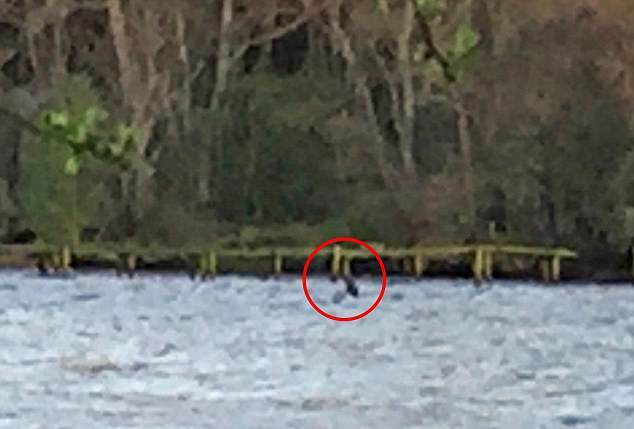 The 51-year-old, from Inverness, said: 'She was taking pictures on her iPhone at dusk when she spotted a dark shape in the water, higher than the waves. 'There have been sightings of Nessie there before. This a credible sighting but is obviously unexplained. 'I was quite worried that there had been an eight month gap since the last sighting and so was the whole world it seemed. 'I fielded calls from around the world - from Moscow, Adelaide and California, everywhere, asking what had happened to Nessie? 'I am relieved and delighted with this sighting - and so will the planet. 'Last year was a record year for the 21st Century with eight sightings and then she seemed to have disappeared. Mr Campbell said 2016 was a 'fantastic' year for Nessie sightings - which he put down to the growth of smartphones and webcams. He said two of the sightings were by webcam, including one from an online watcher in America. Mr Campbell said: 'It means that there are more people than ever before are looking for Nessie - which would explain the rise in last year's sightings. The last previous sighting was on August 21 when Ian Campbell, a government worker from Argyll, was cycling along the west side of the loch near Drumnadrochit. He was with his son and a family friend when he pictured two creatures in the loch about 33 feet in length just out from the shore. On the same day a Mr Smith, visiting the area, also saw something very similar. It was in 1996, Mr Campbell saw something resembling a 'mini whale' - with a black shiny back - at the south end of the loch. Since then Mr Campbell, a chartered accountant, has logged 1082 sightings. 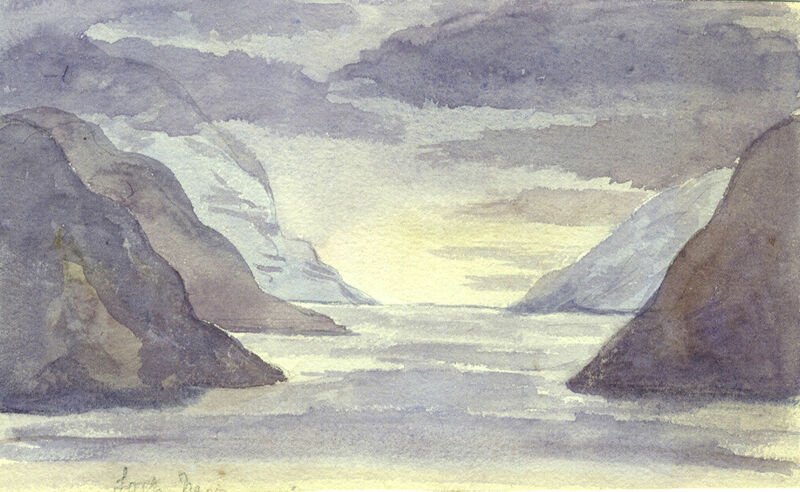 From an album drawn between 1888 and 1892 by C A Grove of Ferne House, Donhead St Andrew, Wiltshire. The album includes views of India, Scotland, Jersey Southern England and their home, Ferne House. We have been unable to determine the first names of the artist, or their relation to Sir Thomas Grove. The watercolours were pasted to both sides of the album pages. 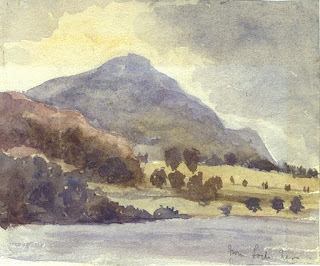 The India watercolours have been left intact. 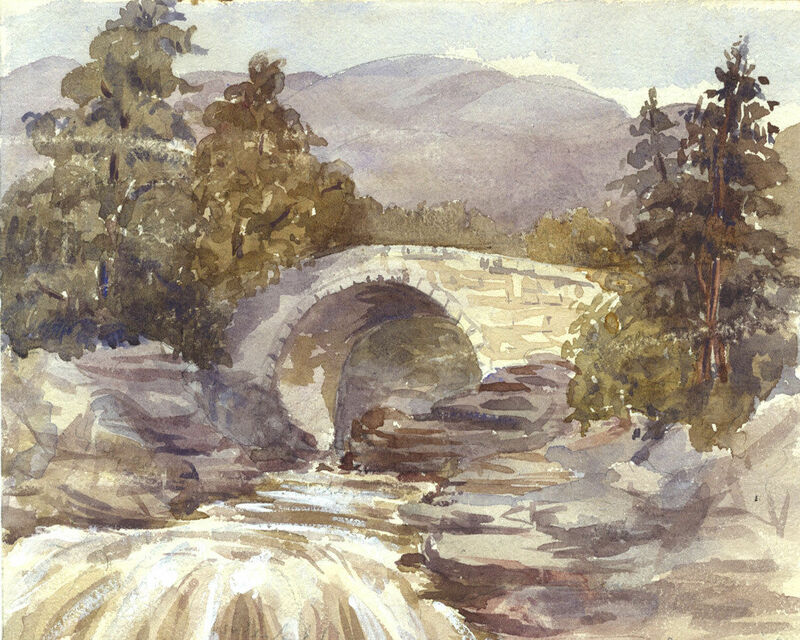 The English and Scottish drawings have been removed from the album pages and the inscriptions copied on to the reverse. 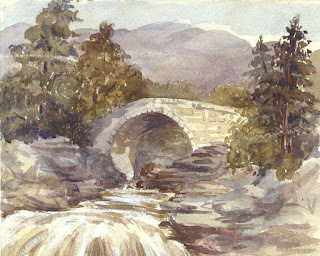 I like to look at these old paintings and get a sense of the place before technological and industrial advances took a hold and the new roads came along. And, perhaps, one such artist would have painted in a strange, dark looking object that just suddenly appeared as he contemplated the beautiful scene before him. 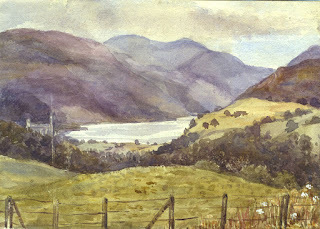 Mind you, some of those hills look well out of proportion, especially in the first painting! "Loch Ness near Fort Augustus"
"Salmon Ladder, Invermoriston, Loch Ness"
"From a Boat on Loch Ness"